WHAT makes a great performance space for dance? Once upon a time, I would have answered this question in terms of sight lines, comfortable and appropriately spacious seating, stage size. I still think these things are important, if we’re talking theatres. 2018), in a caravan (AIVDT’s Life in Miniature, 2012) – you get the idea. While the concept of site-specific dance isn’t new (the Judson group were doing it back in the 60s after all), it feels like it’s becoming increasingly popular with Australian artists and companies. It’s true that site-specific dance presents challenges – often the spaces only permit small audiences, the audience is frequently mobile which requires management and doesn’t guarantee decent sight lines, the floor is almost certainly not sprung – but it also offers experiences for both artists and audiences that could not be found in a conventional theatre setting. Site-specific dance has the potential to be intimate and immersive, to allow punters to see dance, quite literally, from a different angle. It also has the capacity to take the audience on an adventure, to places they wouldn’t normally be able to access, or enabling them to see familiar spaces in a new light. So it’s no surprise to see a site-specific work on the (impressive) dance line-up for 2019’s Perth Festival. Presented by STRUT Dance and directed by UK choreographer Maxine Doyle (Punchdrunk), Sunset will be performed at the Sunset Heritage Precinct, a heritage building that was established in 1904 as an old age home. Later a hospital, it fell into disuse when the hospital closed in 1995. Although parts of the precinct were reopened in 2016, most of it has remained unused and unseen by the public. And what will the audience experience? Sunset is the culmination of a three-year partnership between STRUT Dance and Maxine Doyle. Partnerships such as this one are central to Selwyn Norton’s vision for STRUT and, under his leadership, Strut has given Australian independent dance artists the opportunity to experience the work and methods of various internationally acclaimed artists, including William Forsythe, Crystal Pite and Hofesh Shechter. Particularly memorable for audiences was the performance of William Forsythe’s One Flat Thing Reproduced in 2017, which attracted a cast from around the country. ‘Sunset’ plays at the Perth Festival until February17. For more about that work and the full dance program go to www.danceaustralia.com.au/news/dance-to-savour-at-the-perth-festival. 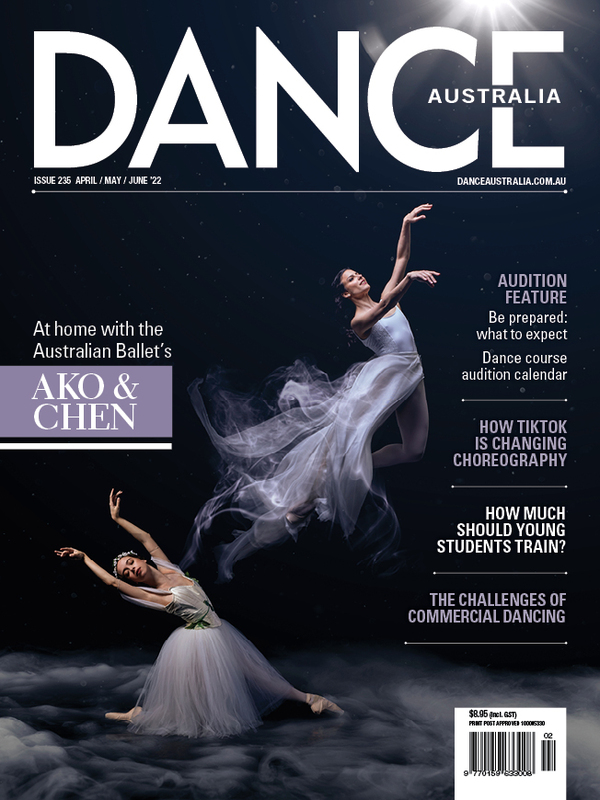 This article appears in the February/March issue of Dance Australia... OUT NOW! Want more like this? Buy the issue from at your favourite retail outlet, or buy it online here... OR never miss an issue by subscribing here.